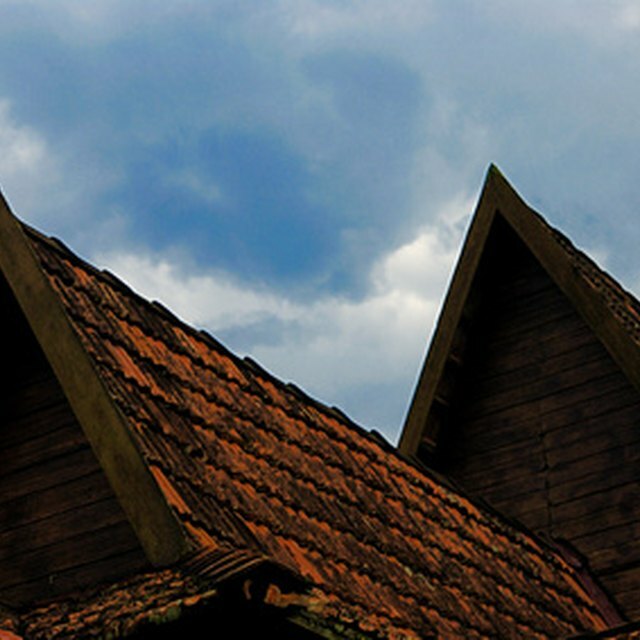 Whether it's a damp mark on a ceiling, an extremely humid house or water accumulation in your attic, the first thought a homeowner often has is, "Oh no, my roof!" Some causes of roof leakage can be traced to the installers; others may have to do with a lack of upkeep. In any event, keep in mind that materials don't last forever, and some roofs are just worn down by weather over time. Roof leakage is caused by a variety of factors. When a roof is constructed, it is usually coated with a waterproof seal to prevent leaks. If this sealant is not reapplied after a few years, damage can begin to occur. Ask the people who constructed your roof when they put the coating on, as it may have been months or even years before you moved in. Hire contractors to reapply a coating or apply the coating yourself after taking safety precautions. There is no way around it, if your roof was poorly constructed, it may be prone to leaks. Poor construction may involve poor materials, an inexperienced company or unrealistic deadlines that forced the installer to cut corners. If you determine that this is the cause of the problem, hire an experienced constructor to determine if spot repairs will be adequate or if the entire roof needs to be replaced. Plumbing vents are held together by collars or seals that keep water and other materials inside. Ten years of weather exposure and other wear and tear can cause the seals to split. This can lead to water spraying out and affecting your roof. Have the seals replaced and have the vents inspected for other potential problem areas. During the winter, water in a clogged gutter can freeze, creating an ice dam. This blockage traps melting snow around the low edge of the roof, which leads to a backup of water that seeps under shingles or slate. This problem can be avoided by regularly cleaning the gutters, especially before the winter when leaves and other materials are likely to be present. If you have lived in a house for a long time or you purchased an older house, you sometimes have to deal with the inevitability that nothing lasts forever. Shingles, cement, finishings and seals can all wear out, producing roof leaks. Sometimes these problems can be addressed by replacing the offending items, but in other instances roof reconstruction may be in order. Keep up on coatings and cleanings to make sure your roof lasts as long as possible.